Review by Olkani [PG] on 9/30/2018. Review by Seleukos on 9/27/2018. Looks pretty, but the empire bonuses make no historical sense whatsoever. Review by warhawk on 10/8/2018. Played "Map of the week" on this. Select your starting position wisely, is all I can advise. All connection were good. Review by Sergei K on 2/28/2019. Good map if you Ike having to deal with multiple fronts, which I do. But not super complicated, and some nice connections along the way. Review by Hroznatinsky on 3/3/2019. Review by Cato on 9/7/2018. Review by IRiseYouFall on 9/7/2018. 3 out of 9 people found this review helpful. Review by ZeedMillenniummon on 9/7/2018. 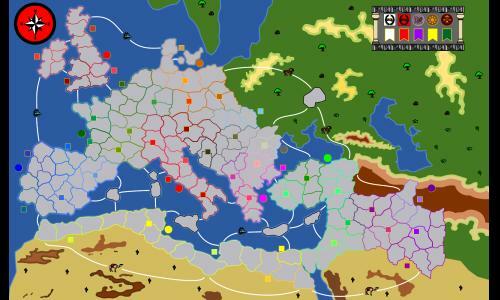 This map is similar to RoR, but it contains much fewer territories (168 vs 273), making it better for strat play. Try the map in 3v3, with 4 picks per player, on the random warlords setting. Also remember that this map is by no means a replacement for RoR, it doesn't play the same at all. The bonuses are a lot different, and there are some interesting connections to travel from place to place easily. If you want the game to be even more competitive you can remove cities ( 1s worth 1 territory) and add in a couple optional cards (I highly recommend gift card). 5 out of 13 people found this review helpful. Review by Xenophon on 9/15/2018. 12 out of 27 people found this review helpful. Review by Sora【𝓒𝓡𝓔𝓦】 on 9/9/2018. 2 out of 8 people found this review helpful. Review by Wulfhere on 9/6/2018. Although the operation has changed greatly from this time, I feel that it is far less usable and slower than the previous one. Please be able to recover quickly. 5 out of 15 people found this review helpful. Review by Tetsushi on 9/6/2018. 3 out of 14 people found this review helpful.